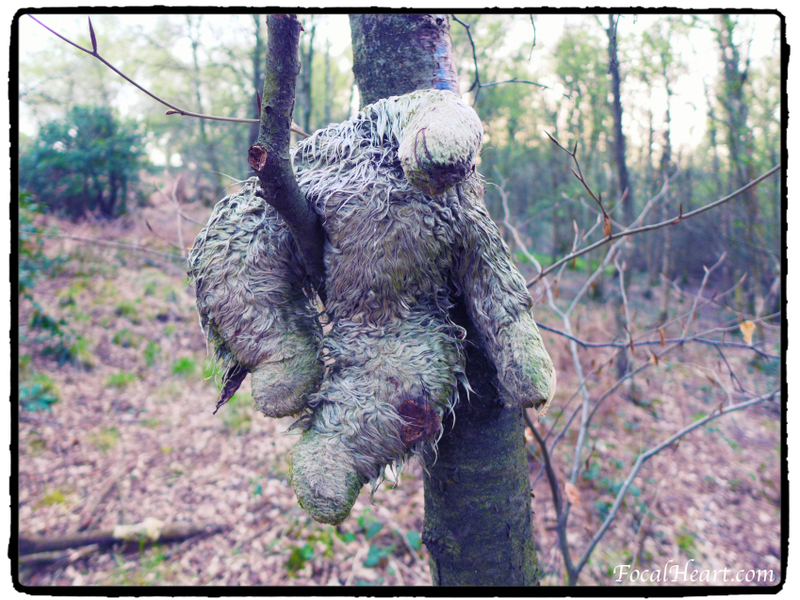 A while ago I found this head-less teddy in the forest. He was sitting on a branch, up a tree just like that. I watched the series Twin Peaks years ago. I am French, but I watched the whole thing in English, over a few nights with my husband (who is English). My brain was in English mode and I did find it creepy when I heard “J’ai une ame solitaire” in French in the film. In the story it’s a suicide note left by the keeper of Laura Palmer’s diaries, but then another character randomly says it later on in the local diner. Each time it made me jump, literally. A french person would probably say: Je suis une ame solitaire, meaning “I’m a lonely soul”, but here it says “I have a lonely soul”. It’s correct, but it’s not the way most people would naturally say it, so it makes it sound even more spooky! This photo reminds me of that quote… A lonely, ghost like head-less soggy teddy haunting the woods like une ame solitaire…. I wonder if Bob got something to do with it…. Gaaah! It always freaks me out when people do mean things to toys! I do love Twin Peaks though… I hope they get the new series finished soon! Maybe the fox was in league with some large birds? This just keeps getting creepier! OK, I’m feeling brave… Share the video!